Carol Channing's Debut In "Hello, Dolly!" "She is glorious," theater critic Walter Kerr raved about Carol Channing's January 16, 1964, debut in Hello, Dolly!. Wearing a carrot-colored wig, her large eyes accentuated with false eyelashes, the actress and comedienne sparkled in the role of Dolly Gallagher Levi—a widow brazenly intent upon remarrying into money. Hello, Dolly!, a musical adaptation of Thornton Wilder's play The Matchmaker, received ten Tony awards, including best musical comedy actress for Channing's performance. It was also named best musical of the 1963-64 season by the New York Drama Critics Circle. 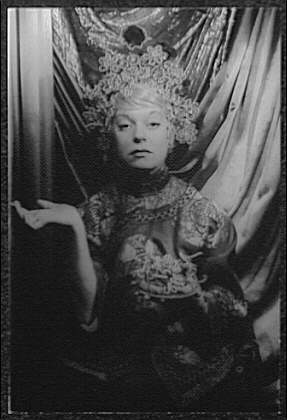 Carol Channing, shown here in a 1956 portrait, was born in Seattle, Washington, on January 31, 1921 and grew up in San Francisco. She first achieved stardom in 1949 for her portrayal of gold digger Lorelei Lee in Gentlemen Prefer Blondes. Several of the songs from that show, including Channing's rendition of "Diamonds Are a Girl's Best Friend," became popular-music classics. In addition to her legendary Broadway career, Channing starred in nightclub acts featuring her impersonations of other popular entertainers. Channing came to national prominence as the star of Jerry Herman's Hello, Dolly! She never missed a performance during her run, attributing her good health to her Christian Science faith. Her performance won her the Tony Award for Best Actress in a Musical, in a year when her chief competition was Barbra Streisand for Funny Girl. She was deeply disappointed when Streisand, who many believed to be far too young for the role, signed on to play the role of Dolly Levi in the film, which also starred Walter Matthau and Michael Crawford. She reprised the role of Lorelei Lee in the musical Lorelei. She also appeared in two New York revivals of Hello, Dolly!, and toured with it extensively throughout the United States. She also appeared in a number of movies, including the cult film Skidoo and Thoroughly Modern Millie, opposite Julie Andrews and Mary Tyler Moore. For Millie she received a nomination for the Academy Award for Best Supporting Actress, and was awarded a Golden Globe Award for Best Supporting Actress. In 1966 she won the Sarah Siddons Award for her work in Chicago theatre. During her film career she also made some TV show cameos and did voice overs in cartoons. One of her best known voice over roles was Canina LeFur in the Disney show Chip 'n Dale Rescue Rangers. Today In History: Hello, Dolly!